In this lesson you learn to play the children's song This Old Man in the key of C major. I show step-by-step how to play the right hand and then the left hand. The instruction follows the sheet music that you can download below. 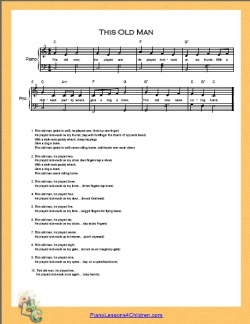 Here is a printable sheet music (PDF file) for the song "This Old Man". It has notes for both the right hand (melody) and the left (accompaniment). Use it while studying this lesson.